Radon is a radioactive gas which occurs in nature and has always been present in the air. You can not see it, taste it or smell it, and it can only be detected with specialized testing equipment. Radon is measured in units, called picocuries. Radon is a radioactive gas which occurs in nature and has always been present in the air. You can not see it, taste it or smell it, and it can only be detected with specialized testing equipment. Radon is measured in units, called picocuries. The curie is a standard measure for the intensity of radioactivity contained in a sample of radioactive material. The curie is named after French scientists Marie and Pierre Curie for their landmark research into the nature of radioactivity. The basis for the curie is the radioactivity of one gram of radium. Radium decays at a rate of about 2.2 trillion disintegrations (2.2 x 102) per minute. A picocurie is one trillionth of a curie. Thus, a picocurie (abbreviated as pCi) represents 2.2 disintegrations per minute. To put the relative size of one trillionth into perspective, consider that if the Earth were reduced to one trillionth of its diameter, the “picco earth” would become smaller in diameter than a speck of dust. In fact, it would be six times smaller than the thickness of a human hair. The US Army Corps of Engineers provided this explanation. You can read their own words here. Some homes throughout the United States have high radon levels. The Environmental Protection Agency (EPA) believes exposure to such levels over long time periods can cause increased risk of lung cancer. 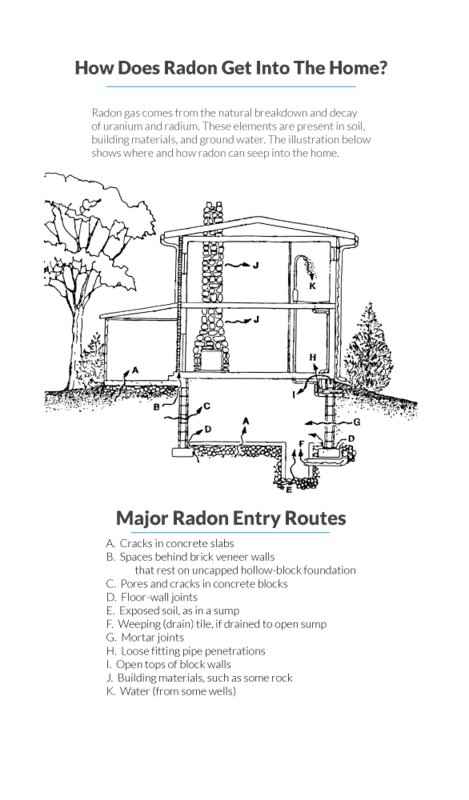 Research indicates the levels of radon in homes can vary significantly on a variety of factors such as soil conditions, the “tightness” of the home and openings through which radon can be absorbed. Radon comes from the natural breakdown and decay of uranium and radium which are present in soil, building materials and groundwater. the illustration below shows where and how Radon can seep into the home. Interestingly, radon test methods vary from day to day in a home, and the levels of radon will change. Unfortunately, because the reliability of testing and multiple theories on procedures, the science has not been developed far enough at this point to provide conclusive information. The EPA strongly recommends that you make follow-up measurements before you make any final decisions about whether to undertake significant efforts permanently correcting the problem. The EPA has determined that homes containing 4 or more picocuries are above average in risk. EPA figures indicate between one and five people would die of lung cancer if one hundred people spent 75% of their time for 70 years in homes with the reading of 4 picocuries of radon. In nearly all cases, elevated radon measurements can be reduced to acceptable levels. It usually boils down to how much it will cost to correct the situation. There are many unanswered questions and conflicting answers regarding radon gas. This has created controversy concerning testing and levels of concern. It becomes your responsibility to gather the facts about radon and then draw your own conclusions. Keep in mind there is no law are requiring radon testing in homes that we are aware of. While a few states specifically require a disclosure responsibility on the part of the home seller when it comes to radon, none requires inspection or remediation. We view this issue as an individual concern. We caution you the laws and statistics can change. It is our policy not to recommend that every home be tested for radon. It is helpful to gain as much information as possible, if you have a concern about radon levels in your home. I hope the data I have shared on this page will allow you to make your decisions easily. Your comments are welcomed. Ask a question and I will do my best to answer you.